My son and I had a lot of Big-Kids meals at Burger King when they had Yugioh figurines. We kept the pyramid boxes that the figures came in as well as the activity sheets. We used the pyramid boxes for goody bags and the activity sheets for place mats. These also were used to entertain until all the guests arrived. We cut the logos off of the boxes from all his Yu-Gi-Oh collectables to help decorate the house. We punched small holes in them, then tied kite string through them and hung them from the ceiling. Bren collected all of the Yu-Gi-Oh magnets for the “Staks” game. He also collected metal medallions that could be worn and used to play on the “hex” game board (short for the hexagon shape of the medallion). 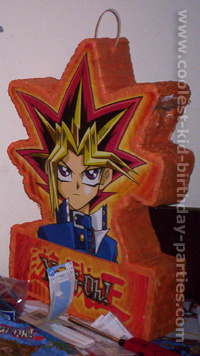 So guess what went into the Yu-Gi-Oh pinata? – magnetic Staks and metal Hexors. He wanted them to have Staks to play at the party. His Yugioh pinata was the pull-string kind, which turned out to be a very good thing, those hexors were pretty heavy, and could have been pretty uncomfortable. I explained that the magnets would be used in the next Yugioh activity and that they need to collect as many as they could. I also told them that they would be swapping during the game and not to worry if they didn’t get too many. We had to make a Staks game board. We took some duct tape to mark-off his magnet board into 3 sections and printed out a Millennium puzzle pyramid and taped it to the center of the board. I printed an example of the board and the directions and rules for the game, from the official Staks website. I read the rules aloud, watched a couple of games to help them work out the kinks. 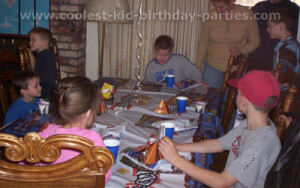 The Yu-Gi-Oh cake was a regular 12×18 inch cake covered in fondant brushed with ivory icing color to give it an antique look. The top is made of Styrofoam that I cut with a Styrofoam cutter, and then covered in fondant to match the cake. The Millennium eye was made with a crafter’s clay gun and painted ivory then stuck on with a small amount of piping gel. But what is it? 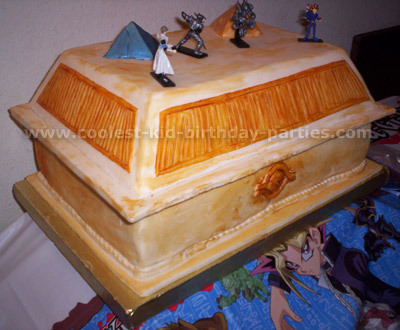 Well unless you’re an avid Yu-Gi-Oh watcher, or like me, desperate for unique ideas for cake, you wouldn’t recognize this as the children would. It is the box (ark) that the millennium pieces were in. The pyramids on top are replicas; one is the puzzle that Yugioh wears, the other (blue one) is the pyramid of light from the new Yu-Gi-Oh movie (2004). I pressed the pattern into the pyramids made of solid fondant and dry brushed them with luster dusts (note that the blue dust usually isn’t something you should ingest, so make it a keepsake. You could use Wilton brush-on colors instead, and would make it edible, not that I would suggest you eat a solid chunk of fondant anyway.) 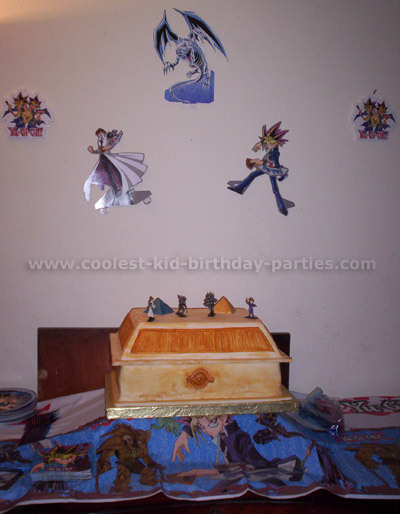 From his Yu-gi-oh figures and monsters he chose his favorites for the battle on top of the cake. Everyone scarfed down Yugioh cake so they could get back to the Yu-Gi-Oh game. The kids pretty much ran the show this year.